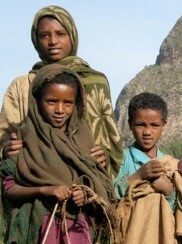 Overview: The Agau are an ethnic group living in central and northern Ethiopia and Eritrea. They are closely related, culturally and linguistically, with the neighboring Amhara and Tigre peoples, but ethnologists believe the Agau have been living in the region much longer than the Amharas and Tigres. The Southern Agau and subgroups that maintain distinct identities are included in the Agau people cluster. The Agau are divided religiously between several Christian denominations and the Sunni Muslim faith. -- James Olson, The Peoples of Africa: An Ethnohistorical Dictionary. Westport, Connecticut: Greenwood Press (1996). P. 13.